I have to say that I have never ever liked the idea of any sort of greens in my drink. Mojitos with leaves floating around in my glass and getting stuck in my straw? No thank you. ::coughs:: And spinach or green pepper or avocado in my smoothies or "healthy" shakes? Not so much. If you're currently eating a delicious dinner, I apologize. I don't mean to make you choke on your dinner. I just never really understood it and when it came to my smoothies, whenever I made smoothies which wasn't all the time, it involved all sorts of fruit and milk and sugar and ice cubes. Yep. Well, I'm older now and I don't use extra sugar or just all that 'extra bad stuff' in my smoothies. I adore spinach and eat tons of it! I had a bag of spinach and tons of already cubed watermelon in the fridge. I love both of these ingredients very much , so why not blend them together? I hardly drink smoothies but I want to change that. I love me some healthy and delicious smoothies but this drink turned out to be more of a cooler; aka a refreshing beverage. And you know what? It's seriously delicious! 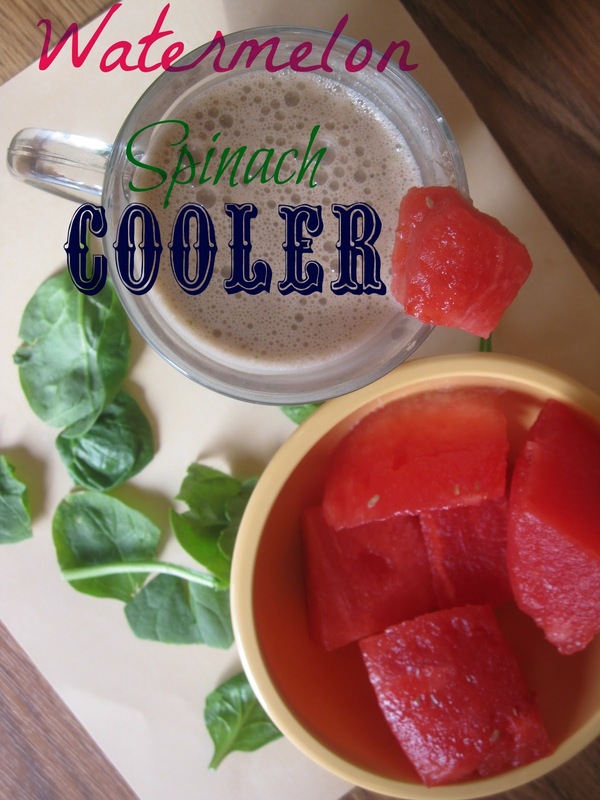 There is way more watermelon flavor in this amazing concoction, but you know it's mega healthy because of the added spinach and other healthy ingredients. I honestly did not think it was going to succeed, but these ingredients proved me wrong. I also feel it might be better not-so-thick in texture. It's great right in the morning or I'd say after a good workout. Or if you are just in need of a simple and refreshing drink on the patio, kick up your heels and make this! -Blend/pulse all ingredients together in blender until combined well and you don't taste any ice chunks. Oh man, this looks beyond amazing. I love anything with watermelon and I'm sure the Greek yogurt just takes it over the edge. The perfect summer drink! Thanks, Carly! It's so tasty!! This looks so refreshing and SO perfect for Summer :). I've actually never tried greens in a smoothie before so I can't say whether or not I like it but this definitely looks like something worth trying!